Decorating with vintage finds can be as easy as finding a cool everyday item like a set of old milk bottles with a metal bottle carrier like the one here that we found at the Hollis Flea Market in Hollis, New Hampshire. We liked the vintage look of this flea market find, and knew it would be easy to find a place to display it. 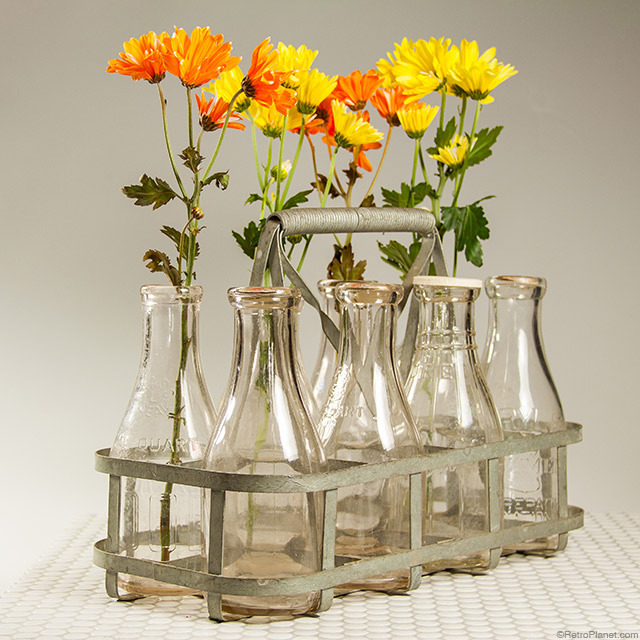 Simply adding cut flowers to the milk bottles repurposes them as vases and has turned this into a great centerpiece for a table. What a great addition to a country kitchen! Repurposing a vintage item like old milk bottles in a metal carrier adds character and interest to any decor—whether it’s already a little shabby chic, more modern, traditional or industrial. A set such as this can be picked up for about $50 or so and they’re fairly common so it shouldn’t be too difficult to find one in decent shape. Most of us already know that there are always great deals to be had at your local flea markets and antique stores!